Front view of the main house. You will have easy access to the Eastern Green. Fabulous views of the Gulf from the carriage house balcony. The entrance to the carriage house from the street. The view of the outside of the carriage house and the balcony. The bright and airy carriage house has a king bed and flatscreen TV. Another view of the main space with seating for 2 and access to the balcony. You have easy access to the outdoor space to enjoy the beautiful Gulf breeze. The carriage house also has a queen sleeper sofa and washer and dryer. The full bathroom has a tub/shower combination. The kitchen has all you need to whip up a quick snack or small meal. The kitchen has a dishwasher, stovetop, oven and microwave. Another view of the main living space and its unique architecture. The carriage house is filled with natural light and beautiful details. The view from the carriage house landing to the street below. The balcony off the carriage house has Gulf views and chairs to enjoy them The bathroom has a separate water closet and spacious vanity. This carriage house is located in the charming community of Rosemary Beach. You are a short walk from the shops and restaurants of downtown Rosemary. Location, Location, Location!!! This classic Rosemary Beach carriage house is located on the Eastern Green just 1 lot off of the Gulf of Mexico! 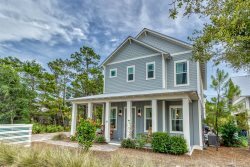 Terra Casa Carriage House on Eastern Green will be your family's favorite vacation home. This true Rosemary Beach carriage house is an absolute gem! With its own kitchen, private bath, and private balcony with great Gulf views, it is sure to please. A King bed and pull out sofa provide sleeping for 4 in the carriage house. The kitchen has granite countertops and everything a couple would need to make a small meal. 3) CONSTRUCTION IS IN PLACE ALL OVER 30A. We cannot be held responsible for construction near the home.